After leaving the ruling All Progressives Congress, the Senator representing Kaduna Central has joined another party. Senator Shehu Sani, representing Kaduna Central in the Senate on Tuesday joined the People’s Redemption Party (PRP), three days after he left the All Progressives Congress (APC). “Sen. Sani maintains the highest respect and honour for President Muhammadu Buhari. However, we prefer to live in a Cottage of Honour than a mansion of shame. 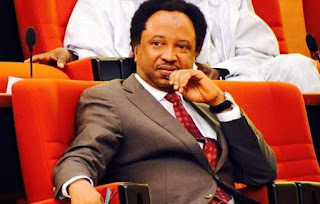 Sen. Shehu Sani has returned to the PRP. PRP represents our socialist revolutionary ideology. Confirming the development to the News Agency of Nigeria (NAN) in an interview, the Kaduna State Chairman of the party, Dr Tom Maiyashi, said the lawmaker was now a member of the party. The lawmaker had announced his resigntion from APC last Sunday in a letter addressed to the APC Chairman, Ward 6, Tudun Wada North, Kaduna State and obtained by NAN. The party’s appeal committee had affirmed Sani as candidate representing Kaduna Central after he was issued automatic ticket by the National Working Committee (NWC). Uba Sani, Special Adviser to El-rufai on Political Matters, was declared winner of the primary election conducted in Kaduna on Oct. 6 for the Kaduna Central Senatorial ticket, by Chairman Primary Election Committee, Matthew Iduoriyekemwen. Sani, however, did not participate in the election because he had been offered automatic ticket by the national body of the party. Following the election, Sani, in a statement by his Special Assistant on Media, Abdulsamad Amadi, said the process was ‘illegal’. The Independent National Electoral Commission (INEC) had given political parties Oct. 18 as deadline for submission of candidates’ lists for the National Assembly and state houses of assembly elections.